The phrase ˜Studio standard" is thrown around far too often when describing recording gear. That phrase has never been more accurate than when describing the DT-770 by Beyerdynamic. Beyerdynamic invented the dynamic headphone 90 years ago, and the DT-770 has been a studio standard, closed-back headphone for over 30 of those years. The DT-770 is a tracking headphone. It has high isolation to keep what's playing in your headphone in your headphone and out of your microphones. The isolation is also to keep outside sounds out of your monitor mix. The huge bass and crispy highs are there to inspire your performance throughout every session. Since these are professional, handmade in Germany tools, every part including the headband, cable, and earpads can be replaced, ensuring a life-long investment. The only difference between the DT-770 STUDIO and the classic DT-770 is the name. 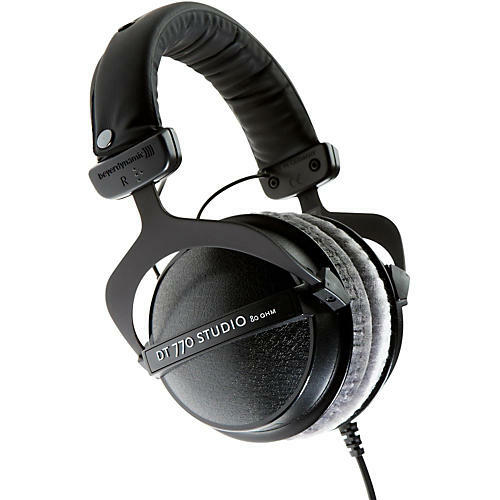 This 80ohm, exclusive headphone is optimized for use in professional recording studios and hi-end recording gear. The word STUDIO has been added to drive the point home that this hi-impedance headphone belongs in the studio. a. In the event of any defect in the item of sale, the choice of remedy shall lie with us. Any expenses connected with the remedying of defects arising from the fact that the item of sale has been sent or taken to a place other than the place of performance shall be borne or refunded by the Customer. For claims to compensation on account of a defect, Section 6 of these Terms and Conditions shall apply. b. The period of limitation for claims for defects shall be 2 years. This shall not apply in the case of fraudulent misrepresentation, willful intent or the cases specified in Arts. 478 and 479 BGB. This shall not affect the limitation period for recovering from the supplier as provided for under Arts. 478 and 479 BGB. The start of the limitation period shall be as specified in the law. c. Warranty shall be excluded if the Customer has processed or resold the item of sale after he has discovered, or ought to have discovered, a defect unless he is able to prove that the processing or resale was necessary in order to prevent greater loss or damage. d. Natural wear and tear and damage through improper treatment, handling or storage is excluded from warranty. e. The return of products is allowed only after prior approval by beyerdynamic.